"Run hot, but always keep your cool." Profile: Getaway is an escape artist without equal. He uses a combination of finesse and logic to get himself out of the stickiest situations. His ability to keep his cool even under the most extreme conditions is legendary. This reputation was born on the battlefield, long before he became a Powermaster, in what has come to be known as the Armornecking Incident: Getaway was leading a routine patrol on the Titanium Turnpike on Cybertron when he and his fellow Autobots momentarily paused to witness a spectacular traffic accident on the other side of the highway. While the Autobots were armornecking (the Cybertronic term for slowing down to see an accident), a troop of Decepticons that had secretly staged the accident swooped down upon them and attacked. The ambush left the Autobots in tatters, leaking fuel and leaving body parts all over the road. Getaway had all four tires blown out, lost vision in his right headlights and most of his left, and lost the use of his plasma-shell shotgun. Despite his condition and the Decepticon barrage, he cooly and cleverly led a tactical retreat to the nearby Polyhex Toll Plaza. The Autobots paid their energon tolls and went through. But, as Getaway suspected, the Decepticons weren't carrying the proper change and tried to pass without paying. This activated the toll gate security system, which snared the Decepticons before they could leave, giving the Autobots the advantage they needed to defeat the Decepticons and Getaway his well-deserved reputation. Rev was a telecommunications scientist on the planet Nebulos at the Hi Q Industrial Research Complex, which was dedicated to inventing new technologies that could be used to prevent Transformers from invading the planet. Rev's belief that the Transformers were more than machines, that they were living, feeling creatures, was instrumental in Hi Q's decision to help a quartet of Autobots survive their visit to Nebulos. 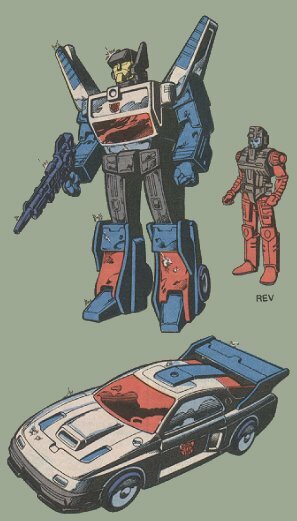 This help took the form of the Powermaster Process, in which Rev allowed his body to be bio-mechanically engineered so that he could be binary-bonded to Getaway and have the ability to transform and function as his engine. As a result, Rev and Getaway are completely interdependent and require connecting with each other on a semi-regular basis to insure their survival. Abilities: Getaway is a master military strategist. In vehicle mode his 600 horsepower racing engine (Rev in engine mode) allows him to reach speeds of 540 miles per hour. He is equipped with bullet-proof windows and shell-resistant battle armor. His range is 1200 miles. An on-board computerized navigational system allows him to plot a long-range course in advance, so that he can give his attention to other matters as he travels. He is armed with a double-barrelled plasma-shell shotgun. Weaknesses: Getaway is one of the toughest Autobots on the road today. He has no known weaknesses. Unless he is using the highest grade energon fuel, Rev has a tendency to knock and stall in engine mode.